by Robert C. Reardon, Janet G. Lenz, Gary W. Peterson, and James P. Sampson, Jr. The latest edition of Career Development and Planning, written and updated by giants in the field of career counseling, is a valuable resource for both career counseling practitioners and their clients. The book’s primary audience is college students and instructors, making it an especially apt tool for counselors working in university settings. I will provide a brief overview of the book, its strengths and limitations, and its applicability for counseling professionals. The authors begin by considering the basic concept of a career—and how it has evolved throughout history—and emphasizes the importance of knowing oneself before beginning career planning. Next, the authors take a holistic look at factors affecting one’s career choices, including the global economy, alternative ways to work (e.g., job-sharing, telecommuting), and family roles. The book’s third section contains practical information on necessary professional skills such as communicating and negotiating. Numerous appendices present resources such as the RIASEC hexagon and guides to academic planning and career-related self-examination. Thus, the authors provide a comprehensive look at the theoretical basis of career counseling, the realities of our economy and job market, and concrete steps for students to take. Practitioners will find this book helpful for a number of reasons. One major strength is that the authors aptly balance factual information with an emphasis on self-discovery. Career counselors know that students often focus on careers that involve prestige, large salaries, and other advantages, and may not consider how well they are actually suited to these careers. The resources in Career Development and Planning can help students assess their values, interests, personality traits, and skills. In addition, contemporary college students often operate with outdated knowledge of higher education and the job market, relying on their parents’ and professors’ experiences and opinions, which may not accurately reflect the present. Unfortunately, the amount of occupational data easily accessible via the Internet is daunting for many students, but a resource like this book can make the career search less intimidating and empower students to stay up-to-date on professions that interest them. However, counselors should be aware that simply handing this book to a student could be overwhelming as well. Because of the dualistic thinking that represents a developmental norm for beginning college students (and the secondary education system’s focus on test scores), contemporary students are trained to look for the “right” answer and may be ill-equipped for the critical thinking that career planning necessitates. It would be best for counseling practitioners to use the book as a guide and work through relevant sections with the student, providing support while empowering the student to ultimately work through the career planning process. Career Development and Planning is a worthwhile addition to any counselor’s bookshelf, especially one who works with college students or members of other populations involved in career planning. The process of developing one’s career necessitates a combination of self-awareness and research into the larger world, and this book provides a comprehensive framework for both. Reardon, R. C., Lenz, J. G., Peterson, G. W., & Sampson, J. P., Jr. (2017). 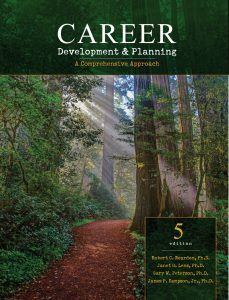 Career Development and Planning: A Comprehensive Approach (5th ed.). Dubuque, IA: Kendall Hunt.